The RELP is a compact and robust lifting Point, ideal for top-mounting and when it is important to have Quick and easy on-hooking. The RELP is a compact and robust Lifting Point, ideal for top-mounting and when it is important to have quick and easy on-hooking. The bolt has a hexagon socket which makes it easy to mount and dismount but an even better feature is the making. On the bolt itself information such as the Working Load Limit, mounting torque and manufacturing ID is stamped so it's always available for the operator. The RELP will automatically adjust to the loading direction which decreases the risk to load it incorrectly and endangering the lifting operation. It also offers a Working Load Limit several times higher than the standard DIN 580 eye bolt, allowing for use of a smaller Lifting Point or higher capacity using the same thread size. 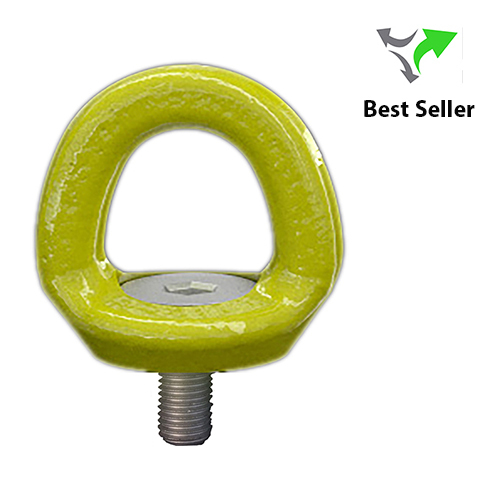 For sensitive load surfaces the RELP is ideal, as the connecting sling hook will be positioned mainly parallel to the load surface, thus completely avoiding the hook causing damage on impact on the load. As with all Gunnebo Industries products, each RELP sold has been proof loaded to 2.5 times the Working Load Limit and visually inspected by a licensed inspector.